A weak contender has limited features and can’t fight common malware. 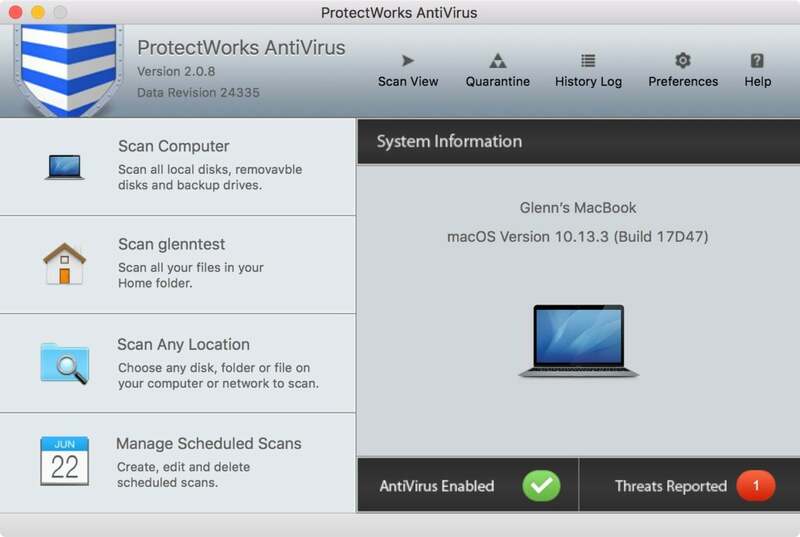 ProtectWorks Antivirus for Mac doesn’t meet our basic bar for antivirus software. Not only did it perform badly in our spot test of known malware, but it wasn’t as good as its competition at detecting macOS and Windows malware in security research lab tests. Those results are shame, given that the ProtectWorks app has a solid interface design, with good descriptions that direct users to the right features without any fuss. That said, the app focuses entirely on virus detection and quarantining, offering no extras like networking filtering or intrusion protection found in other antivirus packages. ProtectWorks offers no-frills antivirus protection. The software lets you choose among a number of common tasks from its home window interface, such as performing a full scan of everything connected to your computer, or managing schedules of scans. You can opt to set up schedules for specific folders or drives, to avoid the overhead of scanning the entire computer. 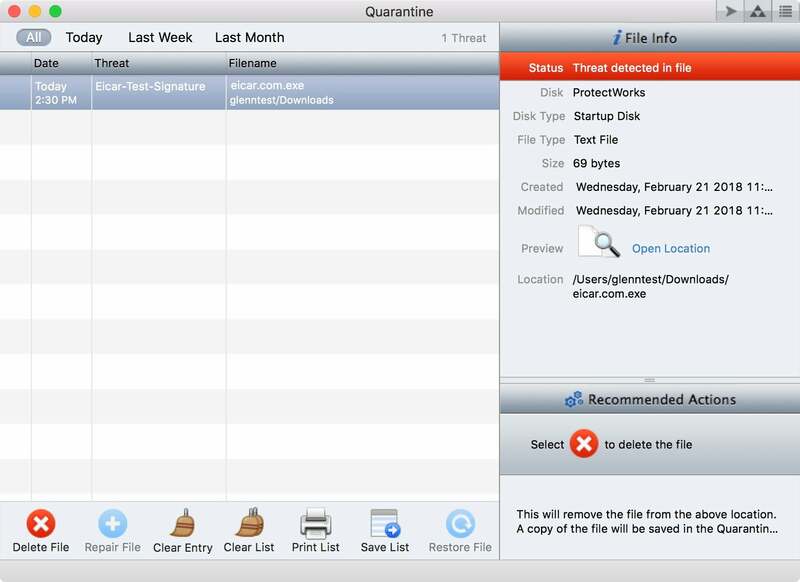 Infected files are dropped into a quarantine section, where they can be viewed or repaired. Unlike some competing AV software, no option exists to delete malware with no user data in it. Instead, you have to visit the quarantine section, select the item, and delete it. Malware can only be deleted manually. Though ProtectWorks enables real-time scanning when first installed—and appears to handle the function of monitoring for incoming dangerous files well—it doesn’t detect enough. For each AV review performed in this roundup, we looked at lab results and also performed spot checks against the WICAR (general malware) and Objective See (macOS malware) collections. AV-TEST found that ProtectWorks detected only 94.6 percent of macOS malware, which might sound fine in isolation, but several packages we reviewed detected 100 percent of macOS malware. For detecting Windows malware, ProtectWorks only recognized 20 percent of AV-TEST’s larger Windows malware database—a disappointing result, given that Mac users can still pass on such nastiness to PC owners. As for macOS PUA, it detected over 85 percent, which is a more typical result for that looser category but not among the best. ProtectWorks' ability to catch malware falls short when compared to the competition. We confirmed AV-TEST’s findings during our own spot-check testing. ProtectWorks failed to identify a number of malware files I downloaded and attempted to execute, while all the other AV software that we recommended detected all or nearly all examples. Additionally, ProtectWorks has no support for detecting ransomware attacks in progress from new malware. This is another key criterion for AV software in 2018, given that ransomware is the current biggest and most successfully exploited malware approach in the Windows and Android world. The security community is concerned that macOS is next. ProtectWorks also receives a lower score for a failure to include either native browser plug-ins or a proxy service that examines links and downloads before they’re clicked or retrieved. ProtectWorks relies on the built-in website blocking in major macOS browsers. Our more positively reviewed AV software offers browser-based detection and blocking, too. ProtectWorks AntiVirus for Mac doesn’t offer enough protection for us to offer even the weakest recommendation for it. The software package doesn’t monitor for ransomware behavior, and won’t well protect you against passing along malware to Windows users. Lacking browser plug-ins, you’re not protected against malicious sites and software on Web sites, either. Its sole strength is a competent interface.